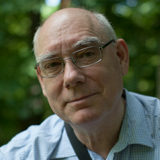 Nathan Benn talks about his career and his experiences at The National Geographic Magazine, as its adherence to the family-friendly editorial policies of the 1950s led to the decline of its relevance and circulation. Next to Miami Intl' Airport at Meranda Company, mostly Jamaican seasonal workers await to be flown home after 3-6 months work as field laborers here, mostly cutting sugar cane. 12000 - 13,000 come through here annually and their revenue is the 3rd greatest producer of foreign trade in Jamaica. Program started in WWII. 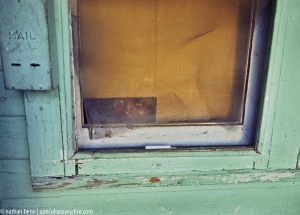 Boy refugee from Haiti staring from the window of a poor shotgun houses in the Overton neighborhood of Miami, Florida. 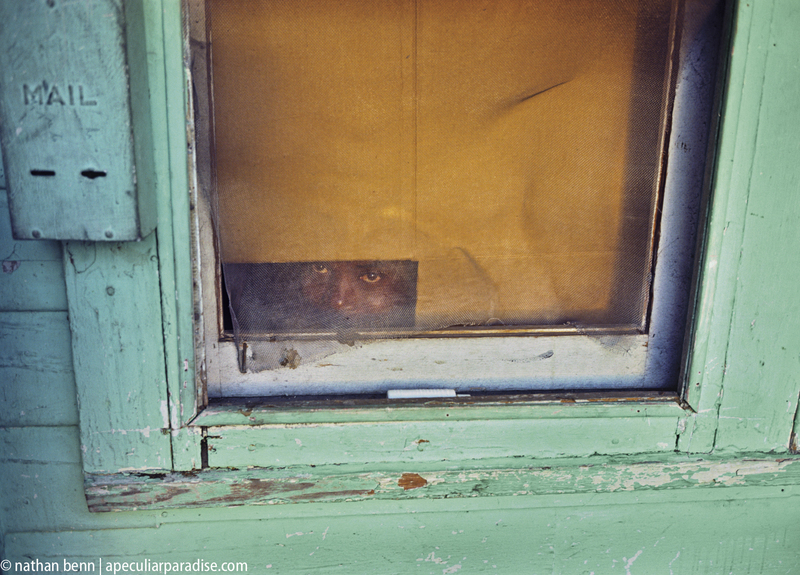 Boy staring from the window of a poor house in the Overtown neighborhood of Miami, Florida. 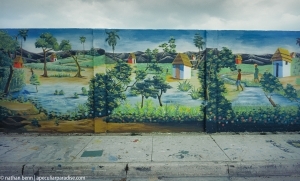 Overtown had many old shacks with a large African-American population and many Haitian refugees and other poor immigrants. 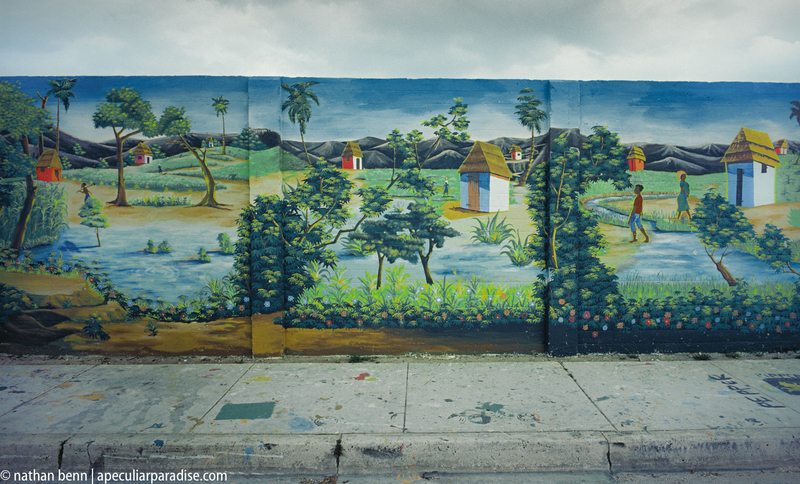 Much of Overtown is considered slum or ghetto and many of the people in these poor neighborhoods lived in poverty. 1981. 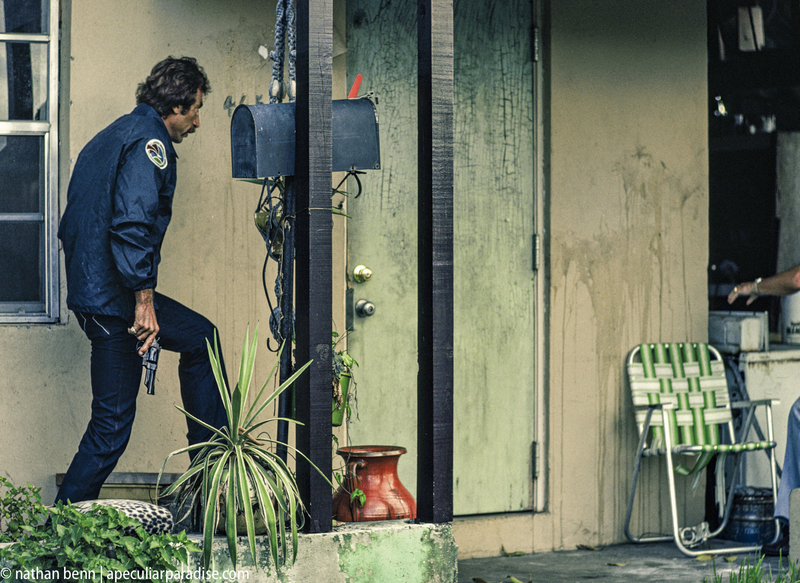 Drug Enforcement Agency agents with guns raiding a home to arrest four narcotics traffic suspects in Miami, Florida. The DEA federal agents with pistols have warrants to arrest suspects based on an undercover DEA agent buying one kilogram of cocaine in the house. The raid is part of effort to reduce narcotics traffic crime. 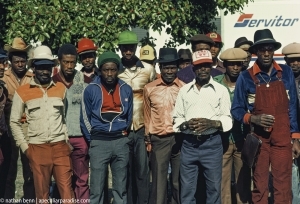 Photograph by Nathan Benn taken June 2, 1981. 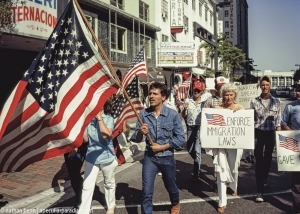 On a Saturday night in downtown Miami, mostly ethnically Cuban, a variety of police activities, including searches and arrests of several young Latins . 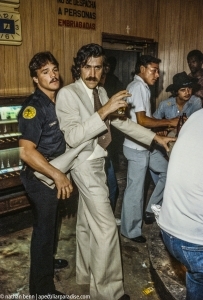 The officer frisked the man at the bar. Arrested man in a jail cell at Miami Dade Police station. 2. 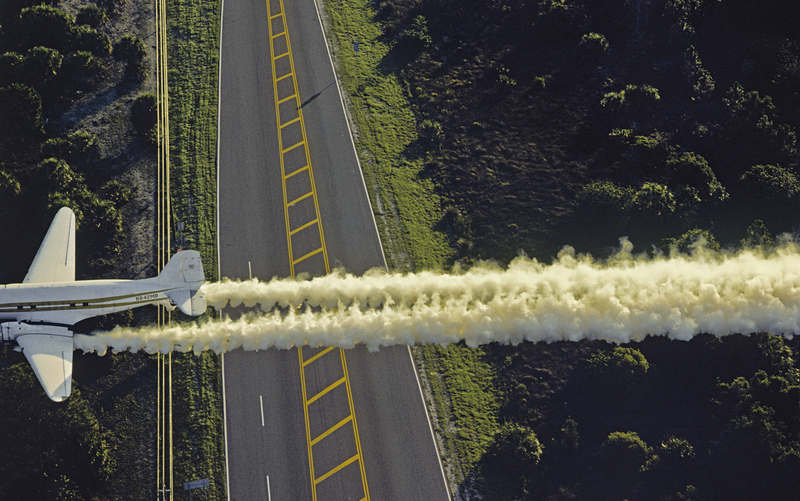 Looking at Florida with Nathan Benn, Part 1: Mar-a-Lago, Clevelander Hotel, Viscaya, Epcot Sphere, Lake Okeechobee, Plane spraying insecticide, Road after rainstorm. 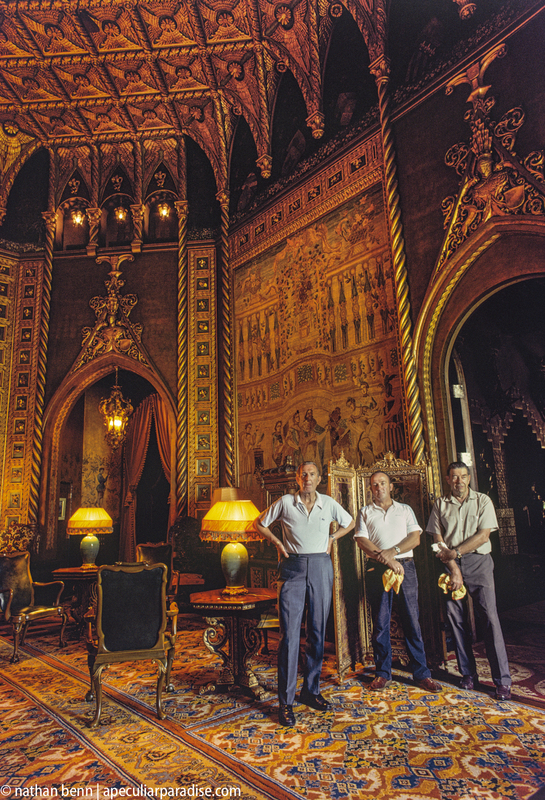 Caretakers in the opulent Hispano-Moresque style drawing room of Marjorie Merriweather Post in her residence at Mar-a-Lago, the fabulous winter villa in Palm Beach, Florida. 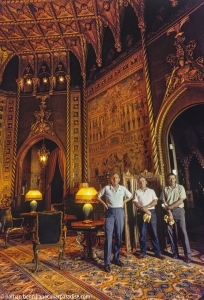 Three members of her maintenance staff stand in the room, including Mr. Frank Moffat (standing left), responsible for household management as head steward or majordomo (on right). 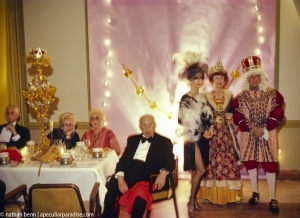 Mrs. Post died in 1973 and before it was sold to Donald Trump to create the Mar-a-Lago Club. The drawing room features antique furniture and tapestries and guilding on architectural features. 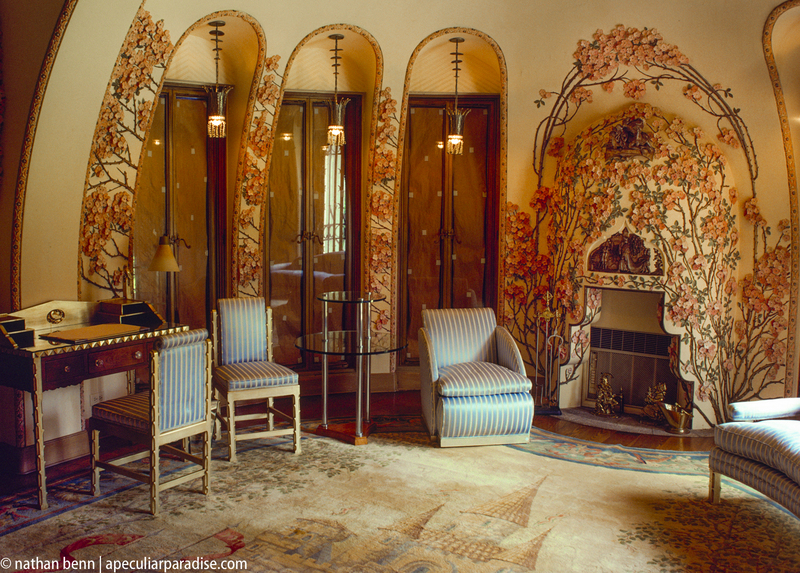 Dina Merrill's childhood bedroom at Mar-a-Lago, designed by Joseph Urban. Vizcaya mansion museum and gardens on Biscayne Bay in Miami, Florida. Villa Vizcaya was built as a waterfront winter residence for wealthy industrialist James Deering and completed in 1916. 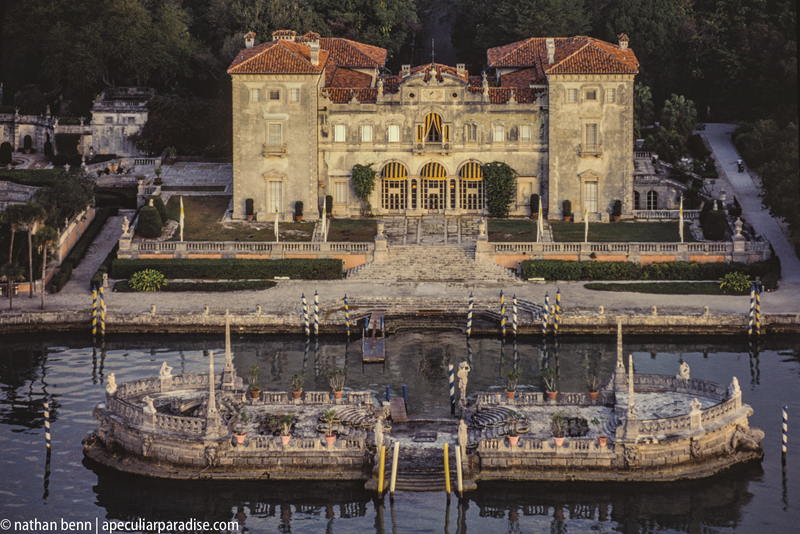 Mr. Deering built Vizcaya as a tropical home when Miami had a population of 10,000 people. One thousand workers created Vizcaya, carving the site and gardens out of native hardwood hammock. The Vizcaya development covered 180 acres. The mansion architect was F. Burrall Hoffman and the landscape architect was Diego Suarez. Wirth 34 decorated rooms, Vizcaya is modeled on affluent Italian Renaissance style villa architecture of the sixteenth century. In foreground is a coral stone barge that acts as a breakwater to protect boats and the mansion from the waters of Biscayne Bay. The estate was acquired from the Deering family in 1952 by Dade County and has since been operated as a museum. 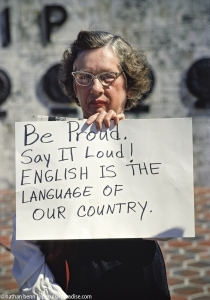 Photograph by Nathan Benn taken February 8, 1981. 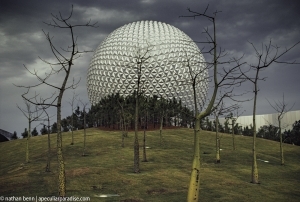 Epcot Center - Disney's billion dollar "experimental community of tomorrow," under construction. To open Oct 1, 1982. Center is "Spaceship Earth," a sphere that will receive a cover of aluminum. 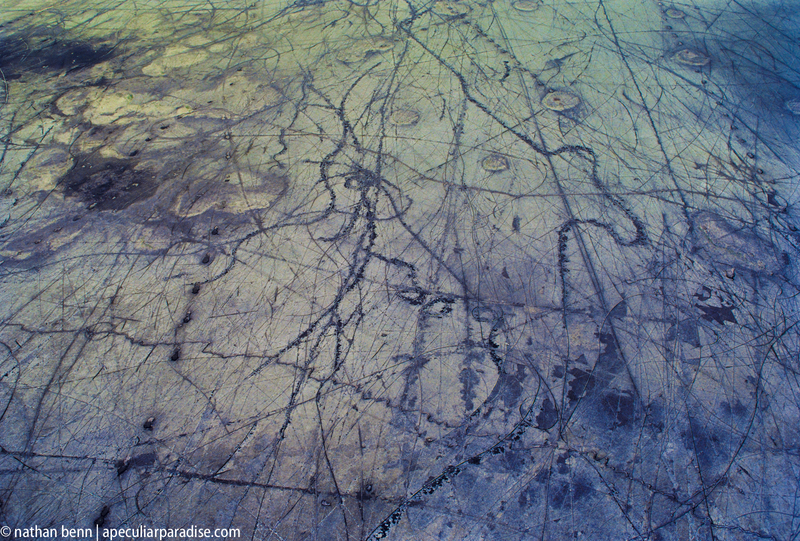 Aerial of scars left by motorboat propellers on a fresh water lake bottom and reservoir as exposed by low water from severe drought south of Lake Okeechobee, Florida. Aerial photograph of scars left by motorboat propellers on a fresh water lake bottom and reservoir as exposed by low water from severe drought south of Lake Okeechobee, Florida. The marks and scars on the lake bottom were carved when the water table was high enough to enable powerboat traffic. The drought in 1981 lowered the water table to the lowest in history, temporarily exposing the lines caused by boats. Although there is environmental damage to the delicate lake bed, the lines created suggest patterns of abstract expressionist art and unusual beauty. 1981. 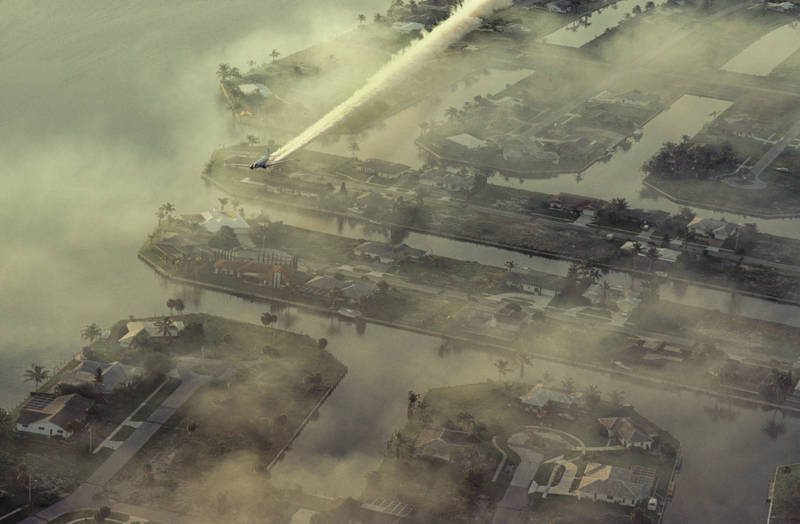 DC-3 airplanes aerial spraying insecticide for mosquitoes control over the Marco Island development in Collier County, Florida. 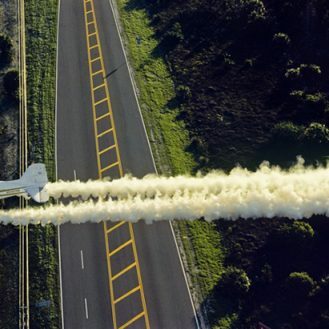 The planes belong to Collier Mosquito Control District and they spray pesticide chemicals to kill mosquitos from about 75 feet above ground. 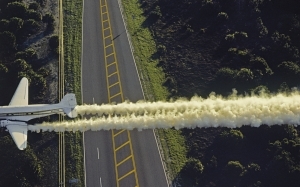 The CMCD is aware of environmental concerns of aerial spraying and poisons and tries to control the insects through adulticiding and Larviciding to limit damage environmental impact. 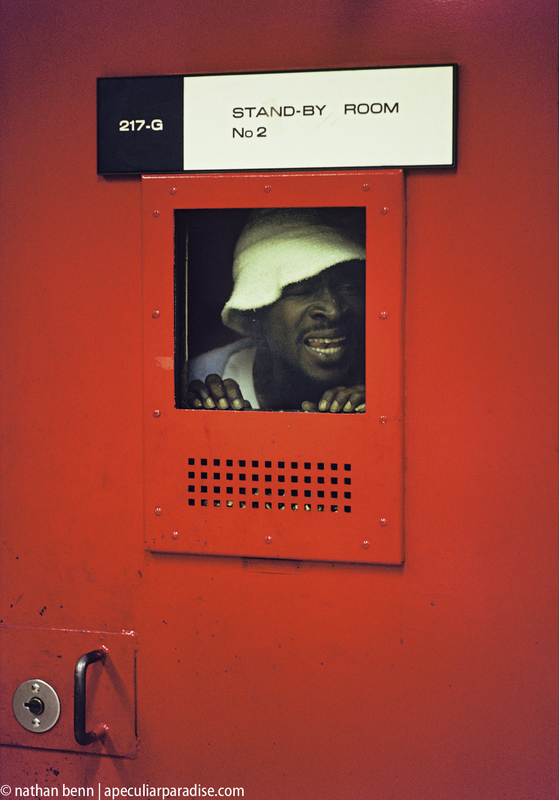 Photograph by Nathan Benn taken June 21, 1981. 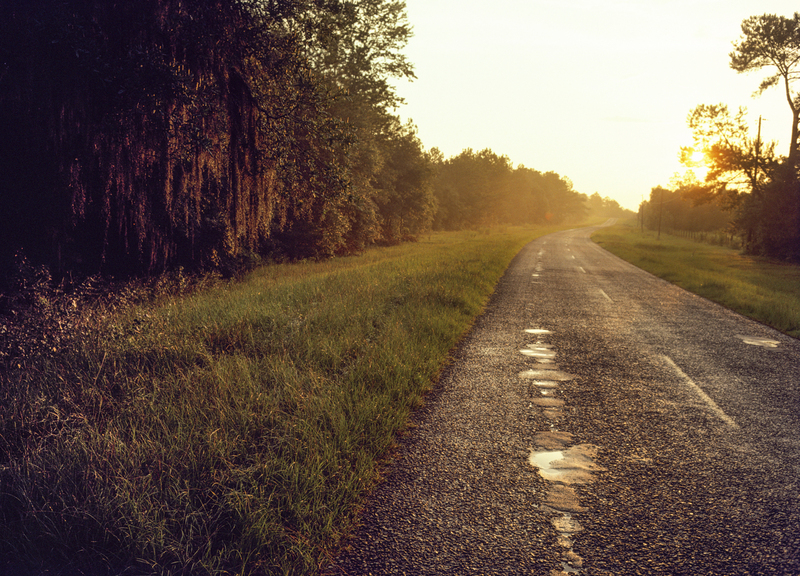 Dusk on a country road after a rain, Route 90 near Tallahassee, Florida in the Florida Panhandle. The image suggests Dixie, the American South, tranquility, modesty, peace, summer, and home. 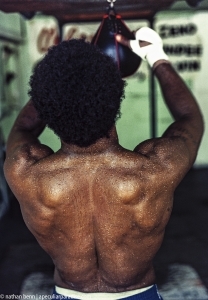 Photograph by Nathan Benn taken August 9, 1981. 3. 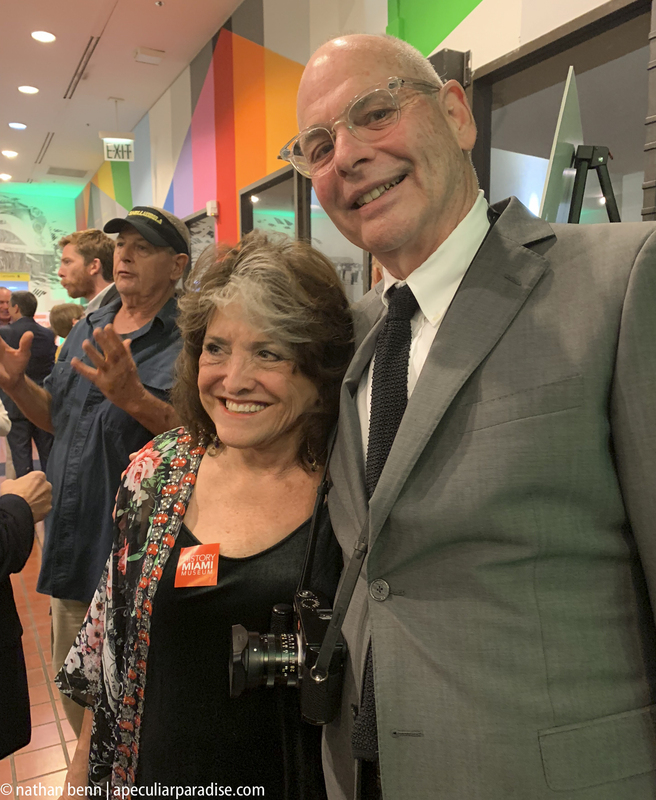 Looking at Florida with Nathan Benn, Part 2: Color vs. Black and White, Curtain, Jamaican migrant worker, Jews singing traditional Yiddish songs on South Beach, the sisters on the porch, the Fifth Street Gym. Boxer training with a punching bag at the 5th Street Gym, a famous sports gymnasium that was established in 1950 in South Beach, Miami Beach, Florida. 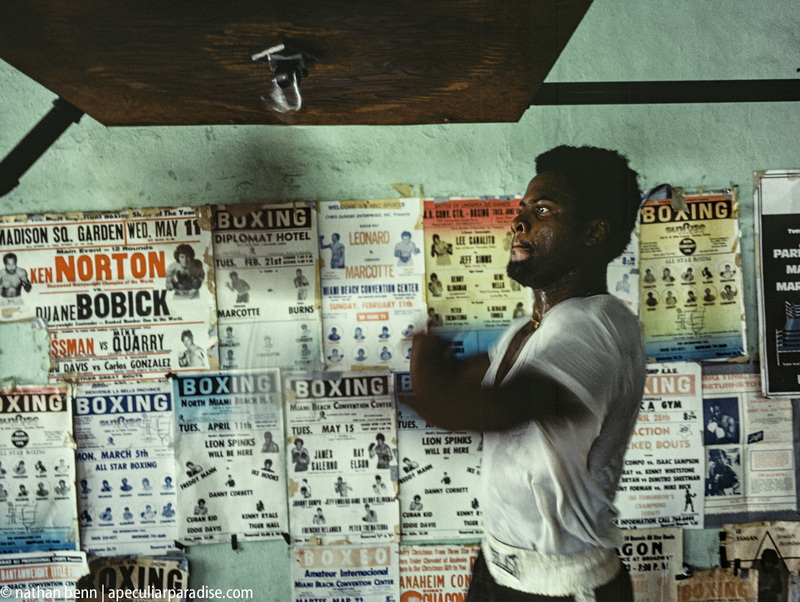 Many champion boxers trained at the Fifth Street Gym including Cassius Clay aka Muhammad Ali. 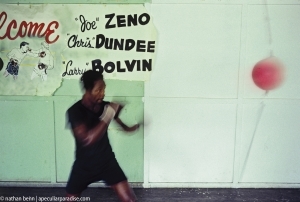 The gym is operated by Chris Dundee, whose brother Angelo Dundee is a top trainer. Chris Dundee is also a fight promoter. 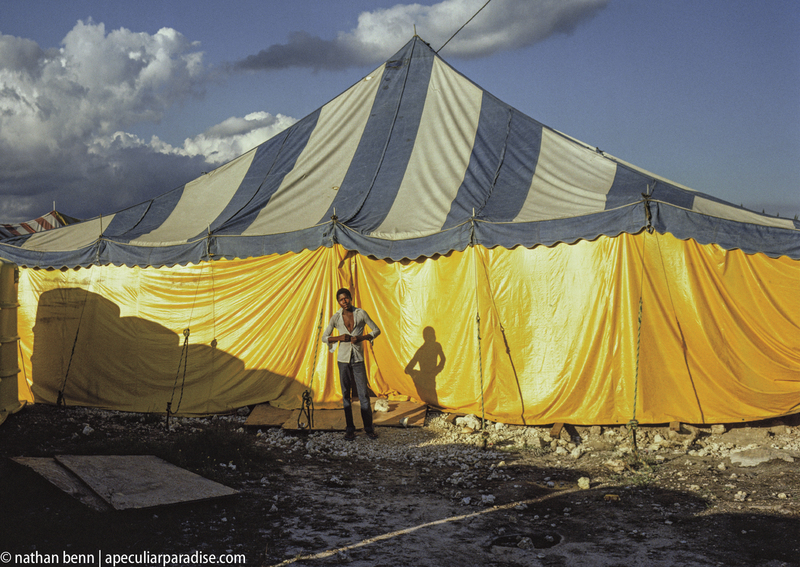 Photograph by Nathan Benn taken June 26, 1981. Sully Emmett collected the Fifth Street Gym's membership dues. Elderly Jews singing Yiddish, Polish, and Hebrew language music and songs on South Beach, Miami Beach, Florida. Most of these Jewish people were born in Eastern Europe in the early 20th century and represent the last generation of Jews whose native language was Yiddish. The woman in the center is the leader of this Jewish Diaspora community singing. Photograph by Nathan Benn taken February 8, 1981. 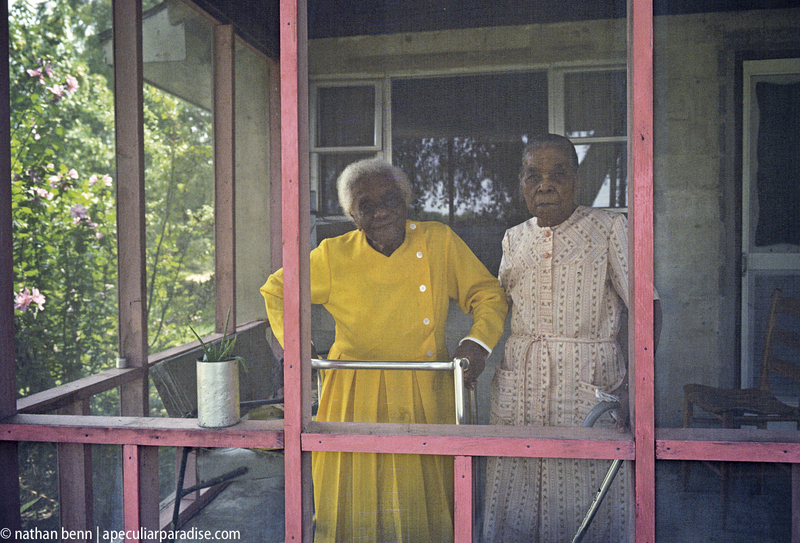 Centenarian elderly sisters on the front porch of their home in Two Egg, near Marianna, in the Florida Panhandle. 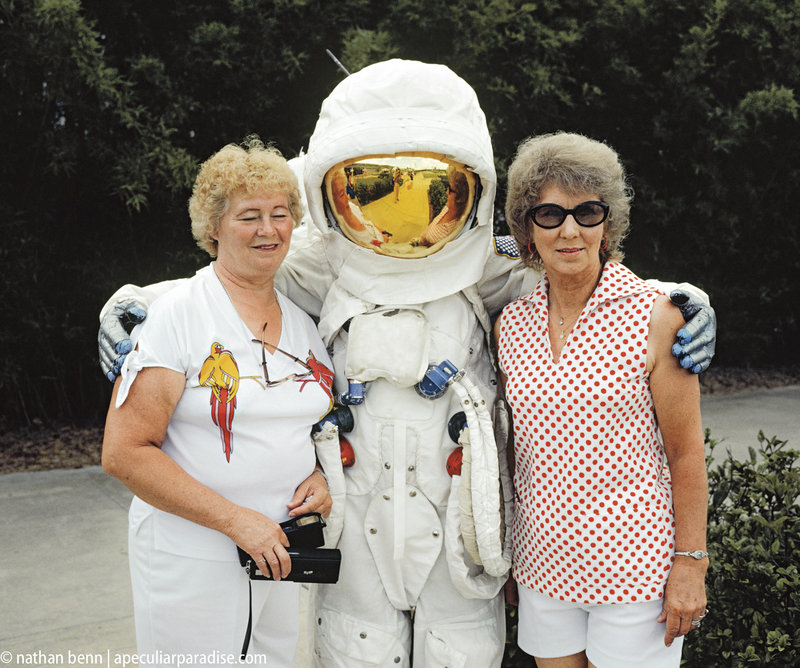 The women are Tommie Kaison in peach dress, 108 years old, and Susanna Hartfield in yellow dress, 110 years old. 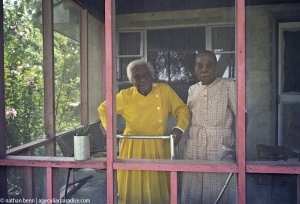 The African-American geriatric siblings live on the same farm where they were born in the 19th century. The sisters are two of thirteen children and always lived on the farm. Two Egg is an historic rural small unincorporated agricultural community in Jackson County. Nathan Benn at the Opening of A Peculiar Paradise at the HistoryMiami Museum, November 8, 2018. The lady on his arm is Merri Mann, his 8th grade English teacher at North Miami Jr. High. At one time The National Geographic Magazine was as much a fixture in middle-class living rooms and dens as Life and the inevitable encyclopedia. One could be sure to find well-thumbed copies in the waiting rooms of doctors and dentists. And, unlike most magazines, they were kept for future reference, making them a more timely adjunct to the encyclopedia. National Geographic’s popularity bespeaks an interest in the world at large beyond the borders of the United States and within them. It was a medium of surrogate travel as well as a source of information. Its readers could visit places far and near, looking over the shoulders of writers who were as professional as travelers as they were as writers. 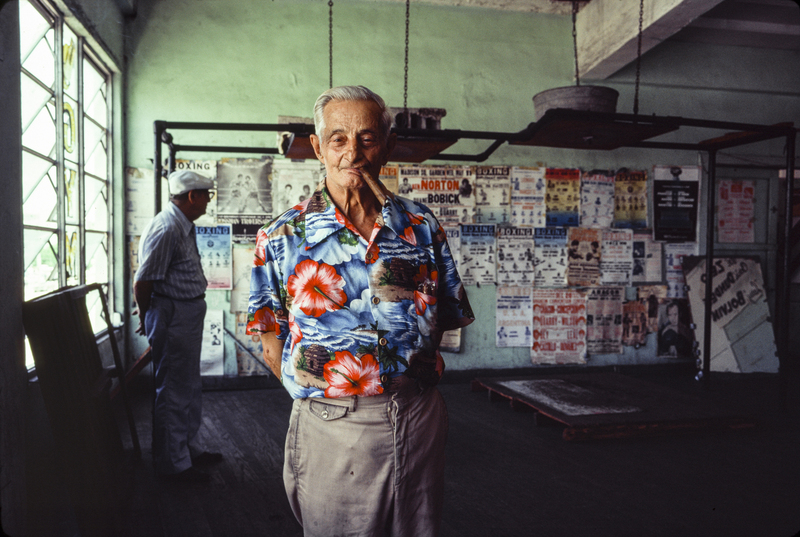 Some, like the legendary Luis Marden, were both writers and photographers. The vehicles of the reader’s discoveries were threefold: the main text, which presented a locality or a topic connected with it as a story, informative and relevant, but engaging and pleasant to read; secondly the photographs, which combined the documentary specificity of reportage with aesthetic standards—after the mid-1930s mostly enriched by color;1 thirdly, the informative power of the photographs was expanded by rather long captions, which explained the images, both in context and detail. At the magazine these were called legends. A separate department was devoted to their productions. The attractive, rarely challenging illustrations generally gave the impression that the world is a safe planet, where people can enjoy travel without apprehension or injury—especially for the armchair explorers reading the magazine. This was often not the case for the writers and photographers in the field, as the photographs you will see here and the photographer’s commentary make clear. Neither the texts nor the photographs were presented as art. As it developed through the twentieth century National Geographic’s editorial policies coalesced into an efficient formula, which carried out its specific mission very well. However, during the turbulent ‘60s and ‘70s, readers came to look for a more realistic, journalistic view of the world. The benevolent, optimistic perspective of National Geographic was seen as a relic of the relatively complacent Eisenhower years—a quality that existed more in the minds of the next generation than in reality. The composition published by National Geographic. The subject of this interview, Nathan Benn, was very much a creature of the new generation. He was 22 when The National Geographic hired him in 1972 and 31 in 1981, when his editors sent him back to his native Florida to illustrate a feature article about its current condition in a troubled time, when the legal system was strained by drug trafficking and local citizens were challenged by a influx of refugees from the Caribbean. When he set to work, Mr. Benn began to push the Geographic’s envelope, both artistically and journalistically. 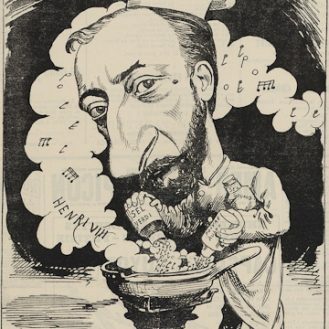 His occasionally satirical social observations and gritty record of crime and law enforcement activity thrilled one of his editors, Wilbur E. “Bill” Garrett, but appalled another one, Tom Smith (as well as the President of the Society!) who was especially set in the magazine’s anodyne values of the Midwest and the 1950’s. 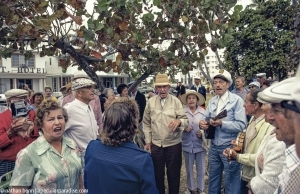 They sent another photographer, Kevin Fleming, to project the desired image of Florida, including only a handful of Benn’s images, often in different, less compelling versions. 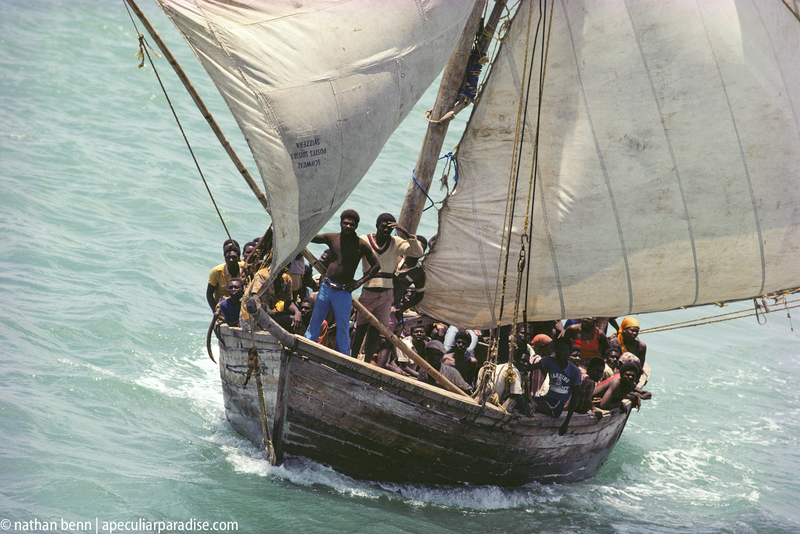 (Compare the brutally direct photograph of a boat packed with Haitian refugees in Benn’s selection with the more decorative version published by the magazine. 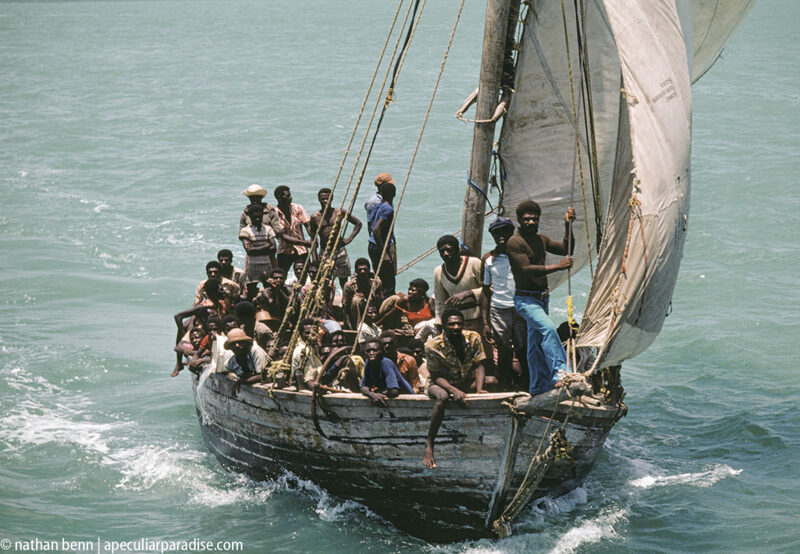 Benn’s version makes us feel the anxiety, courage, and expectancy of the Haitians; in the Geographic’s pick we are distracted by the elegant line of the sail.) As bland as Fleming’s photographs are, the article was ominously entitled, “Florida—A Time for Reckoning.”2 Benn’s original photographs are now on view at the HistoryMiami Museum and in a richly produced book, A Peculiar Paradise. 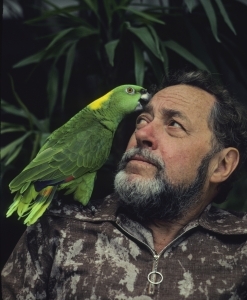 Here you will also see some of those photographs, accompanied by a podcast interview with Nathan Benn, or rather a group of interviews, one about his career at National Geographic and magazines failure to move with the times, and others with valuable commentaries on individual photographs. His telling observations in conversation with the author amount to a master class in how to shoot and how to look at photojournalism. Wealthy people in costume at the Bal des Arts, an annual costume party at the Breakers Hotel in Palm Beach, Florida. The charity gala raises money for the Norton Art Gallery. The Breakers is an opulent hotel that is center for high society events attended by wealthy and affluent people. 1981. 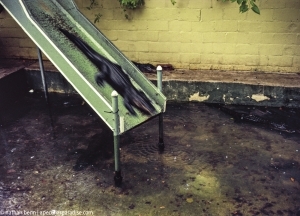 Florida alligator in captivity at St. Augustine Alligator Farm, a roadside tourist attraction on U.S. 1 north of St. Augustine, Florida. The animal is sliding down a waterslide into a small pool. The theme park and wildlife preserve opened as a roadside attraction in 1893 at a different location. College girls in a wet t-shirt contest during Spring Break at a bar in Fort Lauderdale, Florida. 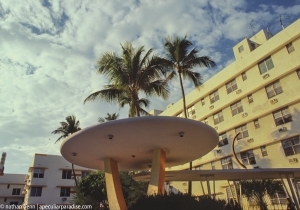 Spring Break is famous for wild parties with much drinking and romance that attract many college students. This party on Good Friday is in the patio of a bar named The Button. Famous American author and playwright Tennessee Williams (1911-1983) with his pet parrot bird at his home in Key West, Florida. Mr. Williams lived primarily in Key West in his later years. Leonard Freed, The Italians (Io amo l’Italia), exhibition now at Ersel, Torino, until July 31, 2012.